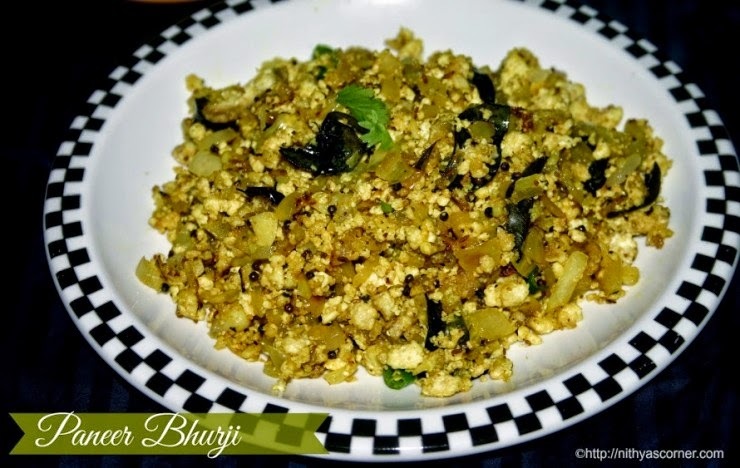 Paneer Bhurji is a very simple and easy dish that goes well with Chappathi. This dish is called as Paneer Bhujia, Paneer Podimass, Paneer Bhurji…..etc. Sometimes, on a lazy day, I make Paneer Bhurji and have it as an accompaniment for Rasam. Usually, I make it when I have less paneer at home. You can also eat it as a snack. I made this recipe last Saturday and wanted to take good pictures, but Gj and Sanvi were very hungry and wanted the dish right away. They were not able to wait for few minutes, so I just took few pictures quickly and served the dish to them. Next time, when I make it again, I have to take good pictures. Preparation time: Under 10 minutes. Cook time: Under 15 minutes. Finely chopped green chillies – 2 to 3 nos. Finely chopped garlic (poondu) – 6 to 8 nos. Beginners, please click “How to make homemade paneer?” for the recipe. 1. Heat 2 teaspoons of oil in a pan. Add mustard seeds and let it splutter. Add onion, ginger, garlic, green chillies, curry leaves, turmeric powder, and salt. Stir well and cook for 5 to 6 minutes. 2. Once onion turns transparent, add grated paneer, pepper powder (milagu thool), cumin powder (seeraga thool), and salt. Stir well. Garnish with coriander leaves. 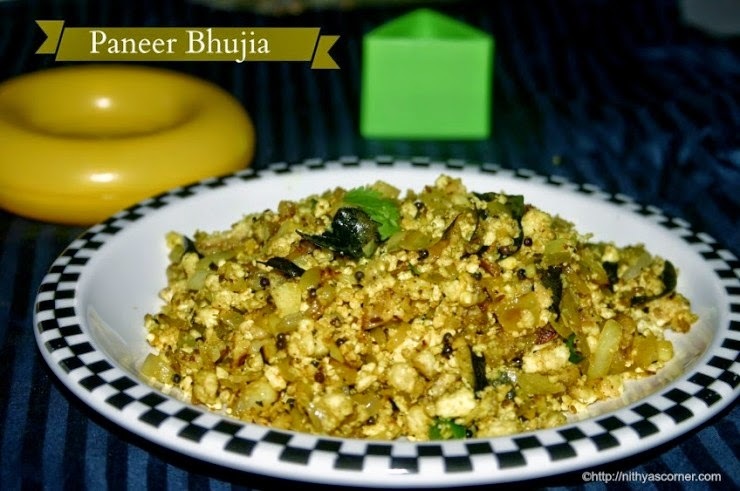 Now Paneer Bhurji | Paneer Bhujia is ready! Serve hot. If you are using frozen paneer then bring it to room temperature before using it. If you do not find time, just immerse the paneer in boiling water for 10 to 12 minutes. You can also thaw the paneer to bring it to room temperature. You can also run paneer once in a mixie/blender to make grated paneer. Serving Suggestion. Rotis and Rice. You can also use Paneer Bhurji as a stuffing for Parathas. 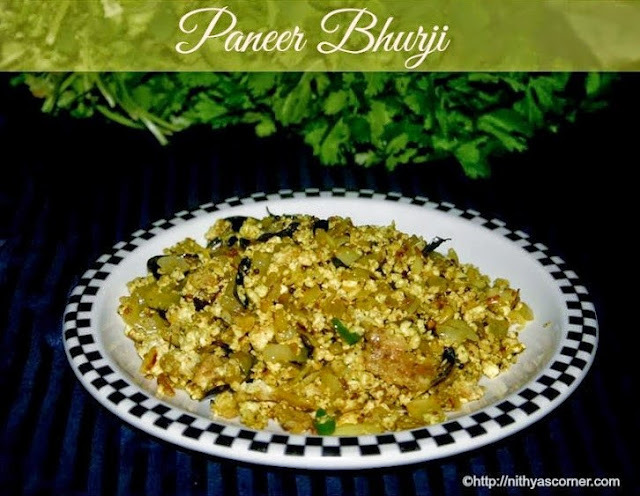 This entry was posted in Paneer Based and tagged Paneer Bhujia, Paneer Bhurji, Paneer Podimass, Turmeric Powder on November 22, 2014 by vikashbhardwaz. 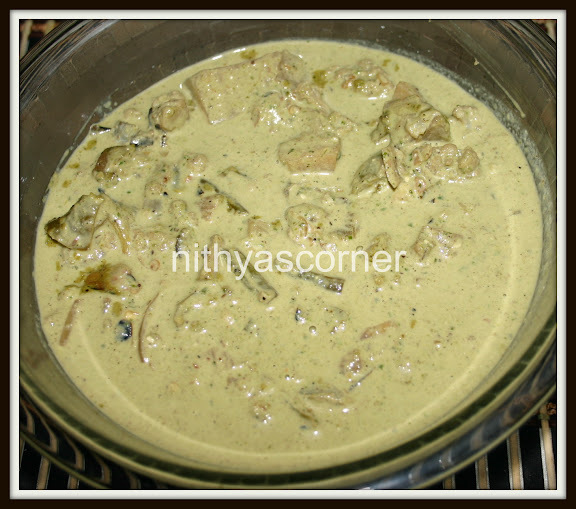 A creamy curry with the goodness of palak! I make Palak Paneer atleast once in two weeks. I have it along with rotis. Just love the dish…Palak Paneer is a HIT in my family. Kids generally love this recipe because of the presence of paneer. It is also very easy to make. Palak Paneer is one way of feeding greens to the kids. Green chillies – 2 to 4 nos. Fresh cream or roasted cashew nut paste – 1/4 cup (Optional). I have used cream. 1. In a frying pan, heat oil and Ghee . Add green chillies and spinach. Saute for 3-4 minutes. Allow it to cool. Grind it into a fine paste. Note. Make sure you fry spinach well otherwise you will get a raw falvor while eating. 2. In the same frying pan, using 1 teaspoon oil, fry the paneer/tofu cubes until they turn light golden color. I have not fried the paneer. 3. In another vessel, boil tomato in hot water for 3-5 minutes. Grind the tomato to a fine puree. 4. In the same frying pan, heat Ghee. Fry onions until they turn golden color. Add ginger garlic paste and fry until the raw smell of the paste goes off. Now add the cumin powder and coriander powder and saute well. 5. Now, add the tomato puree and fry for 3-4 minutes. Then, add spinach puree and add water if required. Do not dilute it too much. Boil for 4 minutes. 6. Sim the fire and add paneer cubes and cream or cashew nut paste and boil it for 3-4 minutes. Now, Palak Paneer is ready!!! Serve: Chappathi, Rotis, and Naan. 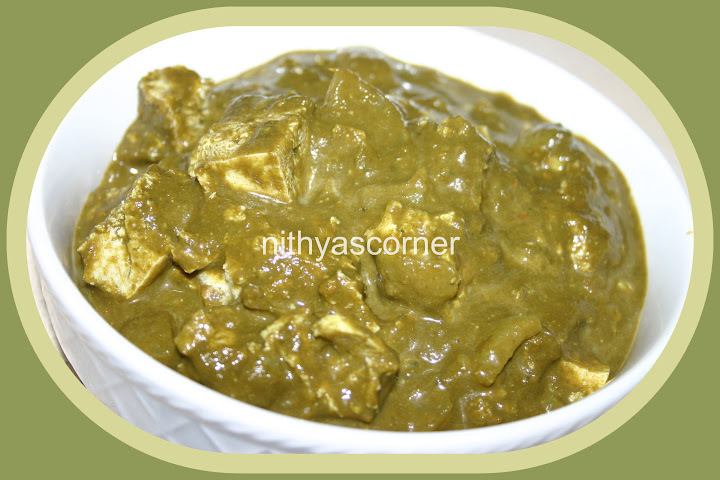 This entry was posted in Paneer Based and tagged Ginger garlic paste, Palak Paneer, Palak Tofu, Paneer on November 22, 2014 by vikashbhardwaz. 1. Heat oil in a pan. Add onions and fry for 2 minutes. Add ginger garlic paste and fry till the raw smell goes off. Add tomato followed by green chillies. Fry for few minutes. 2. Add coriander leaves and mint leaves and fry for 2-3 minutes. Switch off the stove and cool it down. 3. Once the mixture is cooled, grind it in a blender. 4. Heat oil in a pan and add cumin seeds. Once the cumin seeds splutter, add the ground mixture. Boil well and then add Paneer cubes followed by boiled vegetables. Cook once again for 3-4 minutes. Now, the Paneer Vegetable Mint Curry is ready! Serve. Chappathi, Pulao, Dosa, and Friedrice. This entry was posted in Paneer Based and tagged coriander leaves, Curry Leaves, Mint Leaves, Paneer, Paneer Vegetable Mint Curry on November 22, 2014 by vikashbhardwaz. A Royal Tomato Based Gravy! Very less tomatoes! Hardly 1 tablespoon cream! Hardly 1 tablespoon butter! No onions! This is the speciality of this Paneer Butter Masala recipe. I learned it from a chef in a television show. Millions of thanks to him. The combination of Paneer, tomato puree, and milk is divine. I have been looking for Paneer Butter Masala recipe and have tried several different versions. I would say this one is the best. Those who think I can eat only little, think once again! 1. Boil tomatoes in water, cool them down, and grind them. In a frying pan, melt 1 tablespoon butter. 2. When tomato puree boils, add 1 tablespoon fresh cream followed by 1/2 cup milk. 3. Now add salt, chilli powder, cumin powder and kasuri methi. Stir well. 4. Add Paneer cubes and boil for 3 minutes. Then, add 1 teaspoon sugar. Once sugar melts, switch off the stove. Garnish the butter masala using fresh cream and coriander leaves. Now, Paneer Butter Masala is ready! This entry was posted in Paneer Based and tagged Paneer Butter Masala, tomato puree on November 22, 2014 by vikashbhardwaz. Paneer or tofu cubes are cooked in rich creamy gravy. It has a divine taste. I usually have this gravy with rotis and pulao. Though I have cooked this gravy several times, one of my readers Pooja had asked me the recipe for this rich creamy gravy. So, here is the recipe with step-by-step pictures, as promised! 1. In a pan, heat oil or Ghee. Add cardamom, green chilly, and chopped ginger followed by onion. Fry until onion becomes transparent. Now, add chopped tomatoes and cook until tomatoes become mushy. Switch off the stove and cool the mixture. 2. Grind the mixture and strain it. Do not omit this step. Straining is very important though it takes few extra minutes. Strained mixture would be little watery. 3. In a pan, heat oil or Ghee. Add the strained mixture, tomato sauce, salt, chilli powder, garam masala, pepper powder and garam masala in an order. 4. Fry the mixture till the oil separates and forms a thick paste. Add Paneer or tofu cubes. 5. Add milk little by little and stir continuously in low flame for 3-4 minutes. Do not boil for more time. 6. Garnish with the chopped coriander leaves. Now, Shahi Paneer is ready! This entry was posted in Paneer Based and tagged creamy gravy, Shahi Paneer on November 22, 2014 by vikashbhardwaz. Mixed veggies in a rich creamy gravy! Whenever I have surprise guests at home, I make this recipe blind-folded. I can never go wrong in any of the steps. Even if you go wrong anywhere, the cashew-badam-pistachio paste will take care of it. Shahi Vegetable Kuruma is a blessing for the beginner cooks. Definitely, one of my favorite recipes. My family likes this recipe a lot. Needless to say, this recipe is a BIG HIT in my kitchen. Small onion – 1 no. Bay leaves – 4 nos. Vegetables – Cauliflower, Mushroom, Brussel Sprouts, Beans, Corn, Carrot etc. 1. In a pan, heat oil or ghee. Add bay leaves, cloves, green chillies, and ginger garlic paste. Saute till the raw smell goes off. 2. Now add onions and saute well. Then transfer it to a mixie and grind along with coriander leaves and mint leaves. 3. In the same pan, add vegetables, ground onion and coriander paste, and salt. Now add garam masala and saute it for few minutes until vegetables are cooked. Add little water if needed. 4. Finally, add Paneer cubes, cashew, Almond and pistachio paste and cream. Sim the fire and cook for 3 minutes. Now, the Shahi Vegetable Kuruma is ready!!! This entry was posted in Paneer Based and tagged coriander leaves, Mint Leaves, Shahi Vegetable Kuruma on November 22, 2014 by vikashbhardwaz.